The Achla Triangular Nesting Tables come in three pieces of different sizes. they have triangular tops with distinct slatted design. they are made of quality wrought iron with roman bronze powdercoated finish. You will find many uses with the various sizes of this triangular nesting tables. You can use one of them as side table to any furniture or you can find the other size as a table where you can put your things for a while. The powder coated bronze finish looks great indoors or out, and the heavy duty metal construction will withstand almost any weather. 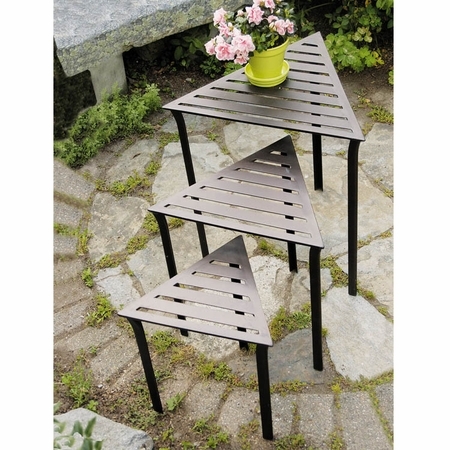 Bring a modern feel to your home or garden with these Triangular Nesting Tables.